Waymo self-driving cars are traveling an average 25,000 miles on public roads each day, and have racked up a total of 8 million miles since 2009. Most of that growth has come in the past year. Autonomous vehicles are getting closer to becoming the norm every day—specifically 25,000 miles closer in Waymo’s case. Waymo CEO John Krafcik announced Friday at the National Governors Association in Santa Fe, N.M. that his company’s self-driving cars are traveling an average 25,000 miles on public roads each day, and have racked up a total of 8 million miles since 2009. Most of that growth has come in the past year. 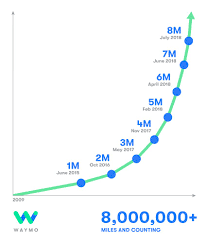 Waymo reached its 4 million mile mark in November 2017, according to Karfcik’s post. That speed of growth is likely to continue as the Alphabet-owned company announced in May that it ordered 62,000 self-driving minivans from Fiat Chrysler for use in its ride-hailing service. “This real-world experience, plus over 5 billion miles in simulation, is how we’re building the world’s most experienced driver,” Krafcik added in his tweet.